Motorola, Nokia and Ericsson quickly established themselves as the leading mobile handset makers. However, several other firms tried to get a foothold in the mobile handset business. Japanese electronics companies including Mitsubishi, NEC and Sony all tried their hand. NEC was the most successful of the early Japanese entrants into the UK handset market. The NEC 9A was Britain's fastest selling handset for a time when it was launched in 1987. It was lighter and smaller than the Motorola 8000X and offered more functions. 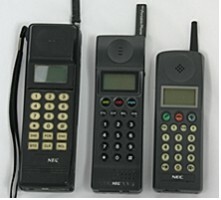 NEC phones were popular amongst business users in the late 80s and early 90s. Although few people have great affection for their products. Sony was a relative latecomer into the handset market. Initially they targeted consumers with the CMH-333, 'Mars Bar' phone. It was small and light. Electronics retailers hoped that the Sony name, which was more familiar to consumers in 1992 than Nokia or Motorola, would make the product a success. Sony was famous for miniaturization. They took the existing mobile and made it as small as it could possibly go. However, this phone was difficult to use and had no display. Sony also initially targeted the analogue market. When they did make a GSM phone, it was brilliant, a challenger to the Motorola StarTAC. However, in the end it was too little too late. Sony teamed with Ericsson in 2001. Sony Ericsson though, failed to make any impression in Nokia's hold over the market. Mitsubishi was one of the first companies to make mobile phones. The Mitsubishi Roamer from the 80s proved relatively popular. It was a slab, rather than a brick. BT rebadged the Mitsubishi Roamer as the BT Pearl. During the 90s Mitsubishi continued to make phones with some success, but was never a threat to Nokia, Motorola or Ericsson. Mitsubishi scored a hit in 2002 with the Trium Eclipse which was the UK's first phone with a 256 colour display. British company, Technophone, was a very early maker of handsets. They claimed that their Pocketphone of 1986 was the smallest and lightest phone on the market. Their advert showed a man putting it into his shirt pocket; it must have been a very big shirt pocket. Nokia bought Technophone in 1991 and continued the brand for a couple of years. Another British firm, Orbitel, beat Nokia, Ericsson and Motorola to make the first ever GSM phone. However, the Orbitel TPU 900, was bulky and soon overtaken by sleeker models. Orbitel produced a range of smaller consumer phones which included the Orbitel 902, the first phone on Vodafone's consumer digital tariff, MetroDigital. Orbitel continued to improve this design in the 90s, but it was eventually absorbed into Ericsson. BT did not manufacture any handsets. They rebranded those made by other manufacturers. In the 80s their phones were distinguished by a deep maroon and black finish. In the 90s they usually sported the BT piper logo. It might have seemed that the mobile phone was the perfect product for Swatch to expand its successful fun and fashion range of watches into. However, the Swatch Cell phone was not a great success. The market was not quite ready for the fun and frivolity of Swatch in 1992, when few people could afford a mobile of any sort. OKI was a Japanese company that distributed phones in the UK through the retailer Martin Dawes Communications. The OKI CDL700E, launched in 1989, was their first product for the UK market. German firm Siemens was a minor player in the mobile phone industry. They made one of the two phones with which Mercury launched One2One in 1993. The Mercury m200, was the cheaper of the two phones, but was far from cheerful. It proved remarkably breakable. Siemens achieved a first with the S10, which was the first phone to have a colour screen. Nortel was a giant telecoms company based in Canada. It supplied network infrastructure and was responsible for large parts of the internet. The company's share price rocketed in the internet boom of 2000 and suffered an equally spectacular bust when the bubble burst. Mobile handsets were a tiny part of Nortel's business. Like Siemens, Nortel made handsets for Mercury One2One. The Nortel m900 had the distinction of being the UK's first Pay and Go digital mobile phone.